Today, on this the last day of June, we come to the last service in a cycle of services. That cycle began over 120 days ago at the end of February with the Sunday of the Publican and the Pharisee. That Sunday preceded the weeks of fasting of Great Lent which led up to the central event of the whole Church Year – the Resurrection of Christ. 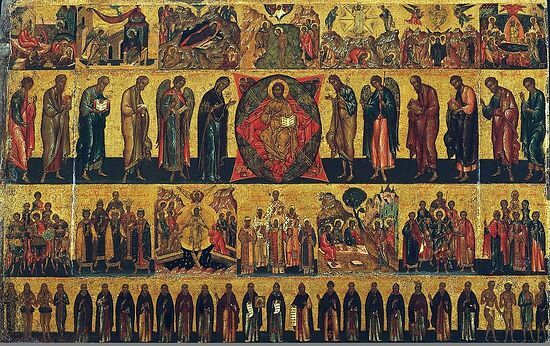 And since then we have followed the services of Bright Week and the Sundays after it to the Ascension, Pentecost and now today, the Feast of All Saints. This whole cycle of 120 days, one third of the year is like a Church Year inside the Church Year. Today’s Feast is the result of all that has gone before it. The purpose of all the events in Christ’s life, from His Conception to the Resurrection and the Ascension and Pentecost is to make Saints. That is the purpose of the Church, to make people holy. Today’s Feast is the Feast of the identity of the Church, of Her sacred personality. For a Church that does not make Saints is not a Church, it is merely an institution which abuses the word ‘Church’. What is a Saint? Firstly, we should understand that Saints are not born, they are made. We are all born potentially to become Saints. The only difference between ourselves who are not Saints and the Saints, is that they are people who are continually picking themselves up after sinning, continually repenting until they attain holiness, whereas we give up. We should also say that there are two sorts of Saints – Confessors and Martyrs. Some Martyrs led very bad lives but then, when it came to the ultimate sacrifice, they found Faith in themselves, sufficient for them to prefer to confess Christ rather than live, and so sacrificed everything for Christ. We recognise their sacrifice and honour it. However, in our time, in our land, it would seem that we are not called to be Martyrs, but Confessors. What is a Confessor, how do we recognise a Confessor? First of all, we could ask people who live near the person whom we believe to be a Confessor. They would know that person’s way of life. But this would not be enough in itself. This would tell us only if the person were righteous or not. And holiness is more than righteousness. Holiness is that utter devotion to God, the confession of Christ before men, the taking up of one’s cross and following, to which Christ will bear witness before His Father in Heaven. It is never denying Christ. It is this devotion of which He speaks in today’s Gospel, which is above devotion to husband or wife, father or mother, brother or sister, son or daughter. And we can be even more precise than this. We have already said that the purpose of the Church is to make Saints. And the characteristics of the Saints are also those of the Church. At every Liturgy and at morning prayers we sing and read the Creed, in which we confess that we believe in the One, Holy, Catholic and Apostolic Church. These words which define the Church, One, Holy, Catholic and Apostolic, are also words that define the Saints. The Saints are One because they are all together. We speak of the communion of the saints. And in today’s Gospel, our Lord speaks of those who have followed Him who will judge the Twelve Tribes of Israel seated on the Twelve Thrones around Him. The Saints are One, they are united. The Saints are also obviously holy. The word Saint means holy. The Saints are also Catholic. This word does not mean Roman Catholic. We mean ‘Catholic’ in the original sense of the word. ‘Catholic’ means the same in all places and at all times. Thus today, on this Feast of All Saints, we commemorate all the Saints of all countries and of all centuries and of all backgrounds. We recall Saints of all ages, of all nationalities, men, women and children, the poor and the rich, the old and the young, the healthy and the sick. They all confessed the same Orthodox Faith. The Saints are universal in time and space; they are ‘Catholic’. Finally, the Saints are Apostolic, for they share in the same Faith and Tradition as the Apostles. Today, by chance, we are also commemorating a local Saint, St Botolph, who in the seventh century was the Abbot and Founder of a monastery at Iken, which is less than thirty miles from here. In St Botolph’s life we can see that he too possessed all the characteristics of the Saints. Thus he was One, united with others. He travelled widely, everywhere he was respected as a man of God, everywhere he met unanimity and made unanimity. He was holy. Immediately after he passed away, he was venerated as a Saint of God. 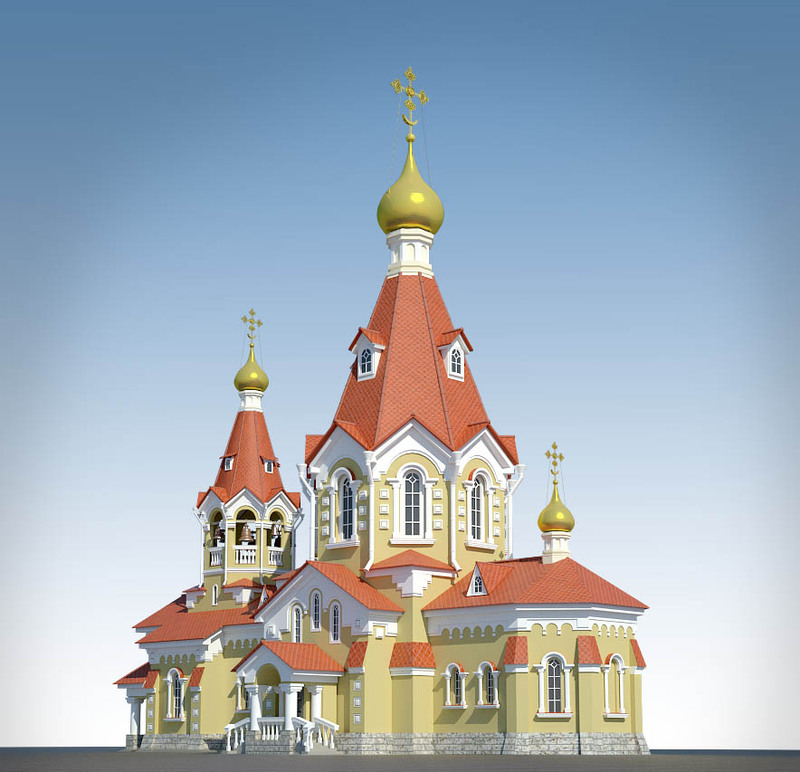 St Botolph was ‘Catholic’, for his veneration was widespread and went even as far as Kiev. Moreover, it has lasted in time, even to this day. Finally, he was Apostolic, because he shared in the same faith as the Apostles, he revered them and read their writings and obeyed and lived according to their precepts. I would like to finish today by quoting the story of another Saint from the seventh century. It is the story of a pious priest who served in a cemetery church. One night, at prayer, he saw a brilliant light hovering over the grave of a newly-buried man, a soldier. He went to look, and saw an angel. At first afraid, he took courage and spoke to the angel who reassured him. The priest asked the angel why the newly-buried soldier was special, how he had come to merit the presence of the angel. The angel replied: ‘It is because not a single day of his life passed without him asking for the prayers of all the Saints of whom he had ever heard. The way ahead for us is clear.